Veteran Yoruba comic actor, Baba Suwe might be making a quick return back to the screens after getting discharged from the hospital. The actor was admitted to the Lagos University Teaching Hospital in February after a public outcry about the state of his health. It was a press release that revealed an improvement in Baba Suwe's health condition. 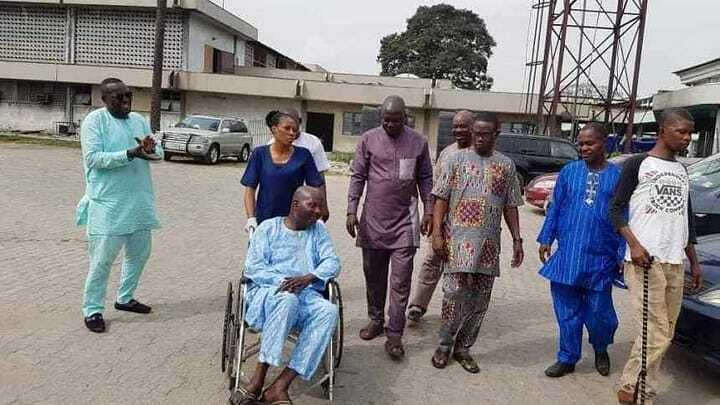 He can now move around without using a cane according to Fabiyi who shared about an imminent plan to take him abroad for more treatment. "I can confirm to you that efforts to quickly stabilize and/or completely treat him to full wellness by medical experts at the Lagos University Teaching Hospital (LUTH) at the instance of Minister of Health are yielding positive results as Baba Suwe can now walk without the stick, less pain and he is getting better. If further therapy are administered and medications adhered to, he will come out completely of the major ailments. He will however proceed abroad very soon to further his treatment." A gesture of appreciation saw him personally sign letters to the people who rendered assistance to him when he was in critical health. Some of the persons include the Vice-President of Nigeria, Prof. Yemi Osinbajo, who donated N1 million to the actor.